Learn something new every day. 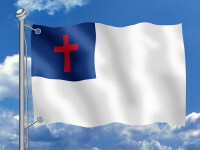 Until today I had no idea there was such a thing as a Christian flag. Funny, I don’t remember reading about it in any of the Gospels. But I digress. This entry was posted on Monday, October 25th, 2010 at 1:38 pm by JEL and is filed under In The News. You can follow any responses to this entry through the RSS 2.0 feed. You can leave a response, or trackback from your own site.